The Epic of Gilgamesh is an ancient Mesopotamian poem that is often considered humanity’s oldest surviving great work of literature. 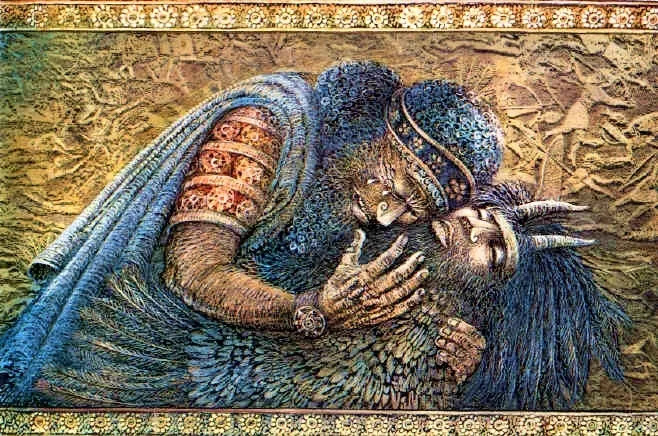 It tells the tale of Gilgamesh, king of the city Uruk, and how the tragic loss of his beloved friend Enkidu sets him on a quest to overcome the diseases of old age and death. Penguin version cover Gilgamesh cries over the body of Enkidu, his beloved friend. After many fantastic experiences, including meeting his immortal ancestor Utnapishtim (prototype of the biblical Noah), Gilgamesh finds, but ultimately fails to use, a flower that can bring rejuvenation. While not achieving his goal in a literal sense, the wisdom Gilgamesh gains on his journey allows him to become a truly wise and just king, and thus achieve a different sort of immortality. The story is a prime example of the “Monomyth” Hero’s Journey, as described by Joseph Campbell’s “The Hero With a Thousand Faces”, and in many ways set the standard for the more well-known Epics that followed. The Gateway represents the start of the hero’s journey. Specifically that of the first hero, Gilgamesh, as he passed through the gates of the city Uruk on his quest to overcome the diseases of aging and death. By joining us we can carry this quest forward together, and help bring healthier and longer lives to everyone. The Cedar represents the long-lived trees and forest animals of the world. In the story of Gilgamesh the Cedar Forest is where key events unfold that lead to the sickness and death of Gilgamesh’s beloved friend Enkidu, the trauma of which sends him on his quest. The Mountain represents endurance, and the hard work that must be done to reach noble goals. In the story of Gilgamesh he must race the sun through the mountain Mashu, risking being consumed by its flames — a powerful metaphor that time is precious indeed. The Ocean represents the waters of life and the long-lived creates of the sea. In the story of Gilgamesh he journeys to the bottom of the ocean to find the flower of rejuvenation — one that can make you ‘be again as you were in your youth’. The Lycium represents the flower of rejuvenation Gilgamesh sought in his quest to overcome the diseases of aging. While he did not succeed, together we can carry the spirit of this quest with science, and work to fulfill the noble goal of healthy lifespans for all.